Once per turn when this ship is given a shoot action, one of her cannons may shoot a firepot at a target within S of her. 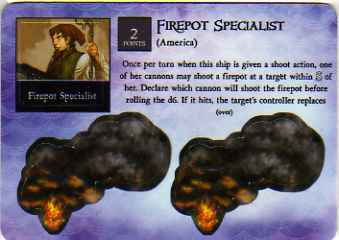 Declare which cannon will shoot the firepot before rolling the d6. If it hits, the target’s controller replaces one of her masts with a fire mast. 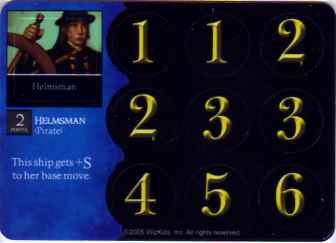 At the beginning of every turn, roll one d6 for each fire mast. On a result of 6, remove the fire mast; on a 1–3, the ship’s controller replaces another of her masts with a fire mast. When a ship has only fire masts, she must be scuttled on her next turn. When a ship docks at her home island or a fort, remove all of her fire masts as a free action.